I've recently written that a major problem I see in discussions of faith is the straw men that are erected by those who would seek to tear down a viewpoint. By creating a flimsy caricature of a belief, it becomes much easier to defeat that caricature than deal with the nuances of the belief itself. This is something that I work hard at avoiding when I discuss a belief different than my own. I absolutely hate the straw man, not only when someone substitutes a flimsy shell for my real belief, but I hate it when I misrepresent someone else's view. It's a form of bearing false witness and if someone values the truth, then straw men have no place in argumentation. Because Christians and non-Christians are equally prone to commit the straw-man fallacy, I wanted to offer some tips on how to avoid misrepresenting someone else's views. These are pretty simple things to list, but sometimes they take a bit of work which may be why they aren't more frequently implemented. But if you follow these guidelines, you will be more informed and a better person for it. I've written on this before, but it bears repeating. Instead of immediately launching onto along, drawn out apologetic against a position that you hear, first find out exactly what the person believes. If you find someone who states they are pro-choice, it's OK to ask "exactly what do you mean when you say 'pro-choice?'" You can then continue to explore their views. Do they believe the government shouldn't regulate any medical procedures? Do they believe that at no time before the birth that a human person exists in the mother's womb? How do they define personhood? By asking these questions, you can get a better picture of that person's particular views and you may find areas where you can point out a contradiction in their thinking. In conversational first engagement, questions like "What do you mean by that," "Can you explain that more," or "Can you give me an example" are key go knowing just where the other person stands. Use them more often and ask more questions and make fewer statements. Once you feel you have understood your interlocutor's point of view, repeat it back to them. Say something like, "If I understand you correctly, you feel that the government should stay out of women's healthcare issues because it interferes with their lives." This approach is what is known as a Socratic dialogue. 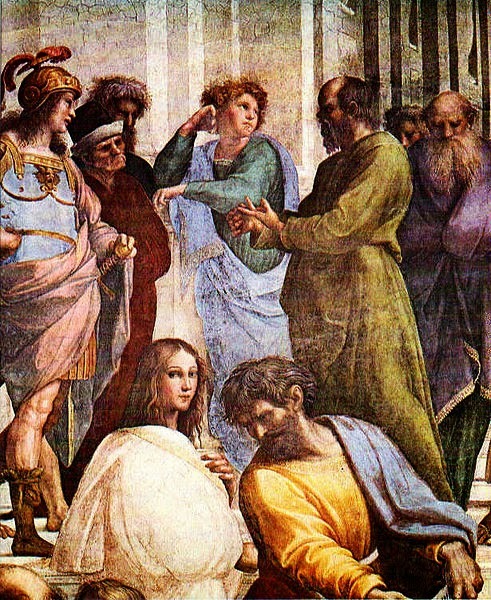 This approach figures prominently in Plato's writings and was further used effectively by Thomas Aquinas. By repeating the person's arguments back to them and ask if they agree with that summarization, you have paved the way to make a convincing argument without the knee-jerk response of "That's not what I meant!" They have just agreed that you have understood their view; thus you are in a better position to be more persuasive since they agree you understand their reasons well. While inquiring from the person gives you a lot of information about their specific beliefs, I think it's also important to read primary sources from the different faith positions to make sure you understand what the actual belief system entails. In talking with folks, I find that thy really don't even know what their own faith tradition teaches and they believe something different than the official dogma/theology of the faith with whom they identify. This happens often in discussions Mormons and Roman Catholics, but it can even be true with atheists or any other belief system. Therefore, it's good to read the actual publications and pronouncements that are held as authoritative. Talk with a Mormon Bishop or read LDS writings. For the abortion debate, make yourself aware of Margaret Sanger's motives and read NARAL's political stances on things like late-term abortions. I realize that this kind of research can only happen after you have engages someone in conversation. If you don't know what you will run into, it can be pretty tough to read up on everything. I know very few Christians who have even heard of Vedanta Hinduism, for example. So, you may have to do your research after your initial encounter. However, Mormons, Jehovah's Witnesses, Muslims, and atheists are common enough that you can begin to study their beliefs and doctrines simply to be prepared in case such an encounter arises. If you can master the basic history and concepts of the more common worldviews, then the details offered during discussion will make more sense. As someone who has been teaching apologetics classes for some ten years, I've covered quite a variety of beliefs. More than once, I've given a presentation on a religious belief system where the people present were either previous adherents or even still practicing adherents. To be told that I was fair in my representation of their view gives my apologetic more weight in their eyes. To erect a straw man is really tantamount to lying about another's belief, and that should never be a part of our witnessing approach.